40 years after unmanned aerial vehicles (UAVs) entered into military service 20 years after such systems assumed combat operations with the US military and CIA, United Nations peacekeepers in Africa are elsewhere are expanding the use of drones to improve force protection and better secure the civilian communities in conflict areas. The use of drones is part of an undergoing ‘technological revolution’ Led by UN Under-Secretary-General for Peacekeeping Operations Hervé Ladsous, aimed to make peacekeeping more effective even at times of growing tension and funding constraints. The new trend has introduced multiple types of drones to UN missions in the Democratic Republic of Congo, Central African Republic, and Mali. Further missions are anticipated in Darfur, and South Sudan. 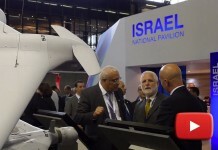 Unlike many military drones, tasked with armed reconnaissance and target acquisition, the drones supporting the UN are primarily used for surveillance and situational awareness. 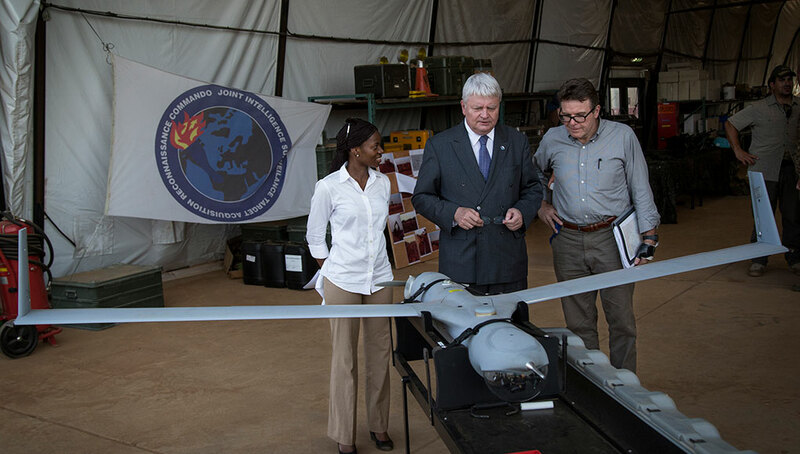 According to Ladsous, UAVs do a better job of protecting civilians, because they provide real-time pictures of situations as they develop on the ground. 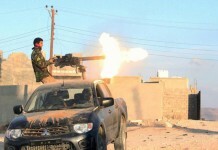 “You can act more quickly and more decisively,” he said. 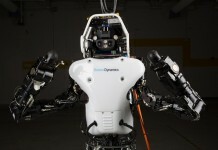 Drones can save lives, by improving the peacekeepers’ security, by providing prior warnings on enemy ambush or attack, and, by staying on station for longer periods, increasing safety and confidence of citizens. 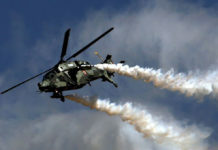 While drones are reserved only for reconnaissance missions, manned attack helicopters are used for the forceful response. The UN deployed such assets along with drones, since 2012. South Africa deployed its Rooivalk attack helicopters to the Democratic Republic of Congo, in support of UN operations there. It was the first combat operation of the helicopter outside South African borders. 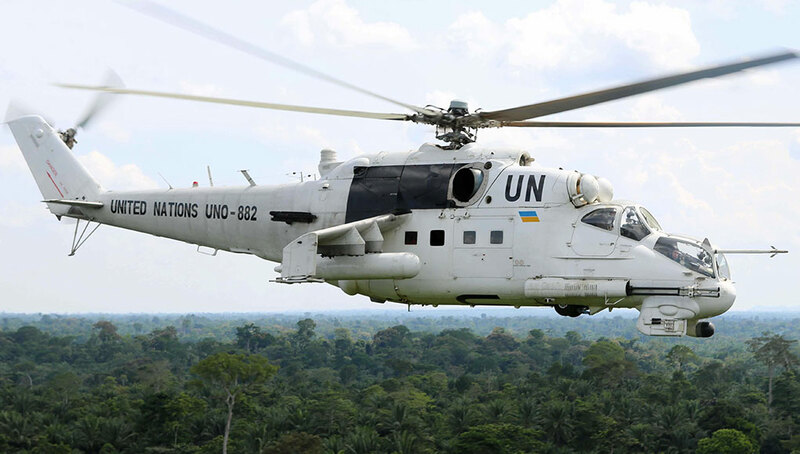 Ukraine sent to the DRC some Mi-24P Hind combat support helicopters, to support MONUSCO operations in the country. When a forceful response is required, the peacekeepers prefer to employ manned assets such as attack helicopters – assets that have joined the peacekeeping operations in DRC and Mali in recent years and used with the drones to enable quick response to evolving threats. Quick reaction tactical aerostats are deployed to improve force protection in UN forward bases in DRC and Mali. A combination of drone and aerostat, tethered ‘Hovermast’ were also tested by UN peacekeepers in Africa. w after several months, following the loss of one of the Apaches in Mali). In Mali, such assets are supporting the ‘International Brigade’, a muscular ‘peace enforcer’ supporting the MINUSMA mission. 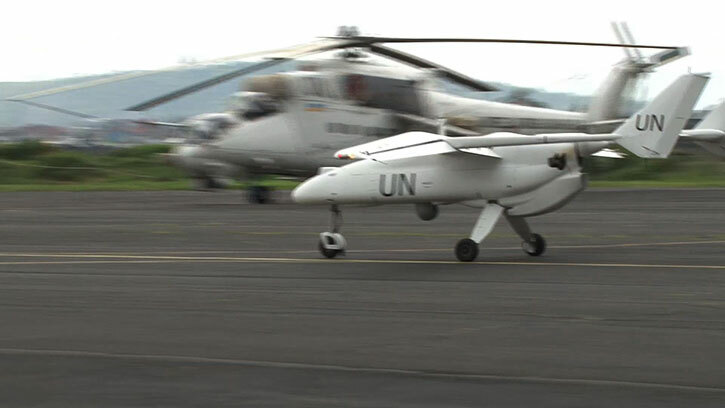 UN Peacekeeping forces are employing unmanned aerial systems such as this Selex ES Falco drone, strictly on reconnaissance missions. When forceful intervention is required, manned attack helicopters are deployed. Other systems deployed by the peacekeepers include surveillance aerostats, used for force protection. Such aerostats were recently deployed in the Central African Republic capital, Bangui. 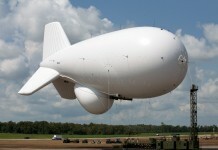 Such aerostats carry sensors, daylight, and thermal cameras. Aerostats are now deployed in northern Mali, soon to be augmented by counter-battery radars, to allow accurate and timely counterfire against mortar and rocket attacks that often harass the peacekeeper’s bases.